← Day 88: Pedestrian Sundays in Kensington Market. What time is it? If you answered deal time, you win! …Um, win what, you might ask? How about bragging rights that your intuitive powers and deductive reasoning skills are more commendable than Homer’s, followed by a hearty virtual pat on the back from me? Yep, you really are that lucky! Okay, getting back to Miser Mondays, today’s most excellent value was a voucher to create a custom 20-page photobook, courtesy of Shutterfly (I paid $10 plus shipping and taxes, retail value $30). Does Shutterfly sound familiar? It should, because it recently gained some notoriety by acquiring Kodak Gallery’s on-line business. If you had an account at Kodak Gallery, you may want to have a quick peak in there to ensure that you have backed up any projects you had, and/or complete them pronto, because although your photos will be automatically migrated to Shutterfly on July 2nd, your projects won’t be. Deep breaths – that still gives you about four weeks to get your orders in – it’s all good! Now, my colleagues in Cork, Ireland had put together a lovely photobook for me prior to my final departure, which I thoroughly enjoy browsing through from time to time, that not only brings back all kinds of fond memories of the people there, but that also tends to make me oddly thirsty. So, I’ve resorted to keeping it in the kitchen, closer to the wine glasses. Everyone seems happier with this arrangement, particularly the faces smiling up at me from the book, as they raise their pint glasses with a hearty ‘Slainte!’ – or, at least, so whisper the echoes of voices in my head. Since my return, I had been meaning to collate my own rendition of Irish memories, that would include pictures of the countryside and other pubs that I frequented over the two or so years that I spent outside the office walls. Twenty pages sounded like that would be just about the optimal amount before my shiny object syndrome would cause me to drift onto something else. The process to create the book seemed straightforward enough, and the user interface at Shutterfly appeared to be fairly indestructible (that is not meant as a challenge, by the way – merely an observation, in tribute to my computer hardware ‘opportunities’ over the years). The step that did take me what felt like forever to complete was narrowing down which photographs I would want to see in the album over and over again. Of course, the photos were not already grouped into one neat little folder, carefully organized and labelled. Heck, they weren’t even on the same computer or memory stick. Who has that kind of time, I wanna know?!!? And would they like to volunteer to get my life better organized? Because, I’ll be perfectly honest, I could use the help, although the pay would be in wine and cheese. But, from what I understand, there are plenty of companies that offer similar roles for even less pay, by calling it ‘an internship’… So yeah, maybe I should post an ad for an intern. Or maybe the applicant can write the job posting for me in lieu of submitting a resume, as a testament to their attention to detail and what tasks they might be willing to perform? I think I’m really onto something here! The 25% of Cork summer day 2011 immortalized. But I digress… Back to the photobook. Creating the project was straightforward, and it even let me put pictures on the front and back covers. I think there were opportunities to add stylistic embellishments throughout it as well, but after the first couple of steps, it really seemed more than good enough to me, and so hopefully, I will love it just the way it is when it arrives on my doorstep a week or so from now. Isn’t that freaking amazing, by the way? 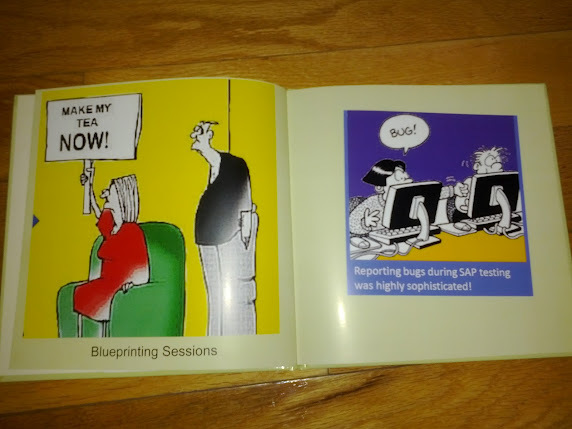 The fact that we can turn on a machine, push a combination of buttons, and cause a parcel to arrive a short time later with our very own, completely customized hard-cover book? I, for one, still find that un-freaking-believable! In completely unrelated news, here is a picture of what my brother ordered for himself on his belated birthday lunch with me at Prohibition Gastrohouse (originally launched as the Booze Emporium, but apparently, they had trouble getting their liquor license with that name, go figure). 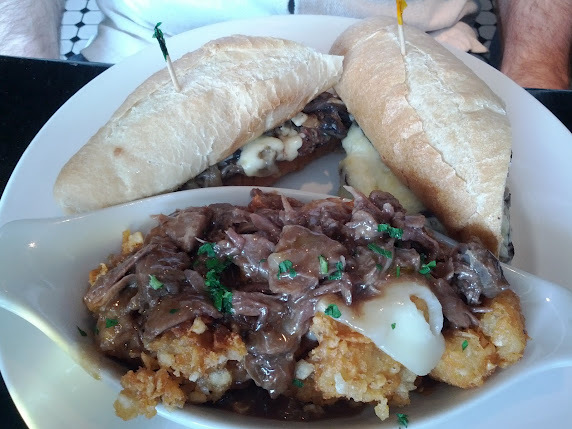 The artery-clogging plate consisted of the daily special steak sandwich with cheese, served with a side of Redneck Poutine (I believe it had hunks of lamb piled on top of homemade tater tots smothered in cheese and duck fat gravy)… There are no words. Much to my amazement, he managed to finish every morsel on his plate, and survived his afternoon shift with neither a coronary nor a nap, but, not so surprisingly, he did not feel the need to eat dinner that night. Or breakfast the next morning, for that matter. Still, Homer J. Simpson would be proud, if not a tad jealous. 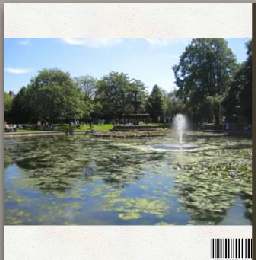 This entry was posted in Home and Personal and tagged deal, Home, Ireland, May, Personal, photobook, Shutterfly, voucher. Bookmark the permalink.